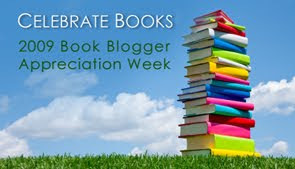 Welcome to Book Blogger Appreciation Week! If you've been under a rock or not checking in with your favorite book blogs recently, then let me tell you a bit about BBAW. Book Blogger Appreciation was started by Amy Riley of My Friend Amy in an effort to recognize the hard work and contribution of book bloggers to the promotion and preservation of a literate culture actively engaged in discussing books, authors, and a lifestyle of reading. The first Book Blogger Appreciation was observed in the fall of 2008 and occurs every September. The week spotlights and celebrates the work of active book bloggers through guest posts, awards, giveaways, and community activities. Book Bloggers are encouraged to register their participation for inclusion in a database of book bloggers. Now that I'm fourteen months into this blog and the community, I appreciate much more the hard work that goes into all of these sites. I love writing for my site and I hope that you enjoy reading it! This week's posts will be memes, an interview and some highlights of other members of the community. I hope that you enjoy this chance to celebrate book blogs and to discover some new writers and friends! To celebrate this week, I would love to provide one of my readers with the chance to enjoy new books! I figure that the best way to do this is to give you a bit of loot to buy some new or used books. How does $25 USD sound? At one of the fabulous online booksellers (Amazon, Powell's, Barnes and Noble or anyone with an e-mail gift card program)? Open to all my friends and readers worldwide, this is a simple one. Leave a comment on this post and include your email address in the comment if you don't have one in your profile. All entries must be posted by midnight Pacific on Friday, September 18th. The drawing for one $25 USD gift card will take place shortly after and the winner will be contacted on Saturday, September 19th. I wish you all the best of luck and hope that those of you who have come for the giveaway consider staying for the blog! Who doesn't love giveaways!? Thanks for the opportunity! I found your blog through caribousmom and saw that you had gotten together wtih a bunch of pacific northwesteners for a book bloggers retreat. Awesome! I love buying books on Amazon! Thank you! Thanks for the chance to win a gift certificate. I'd love to be entered into this awesome giveaway!! Thanks so much. Thank you for the giveaway - very generous! My e-mail is untuneric at gmail dot com. Extremely generous giveaway, thank you I'd love to be entered! I could buy ANY BOOK I WANTED!!! Count me in. Great idea, thanks! Count me in please! I really enjoy your blog, and I can't wait for BBAW either! Oops, forgot my email address: WordLily AT gmail DOT com Sorry! would love to be entered, thanks! Enter me as well, thanks for a great giveaway! Such a generous give away. :) Thank you so much for the chance to win. What a great giveaway! And yes, I think I'll stay for the blog. It looks wonderful. Thanks for the giveaway. I would like to enter this. Thanks for the great giveaway! Please count me in! Yay for this give away! You know how we all love new books ... and I'm no different. Thanks for this. Well, gee, how can I not sign up for this give away. I think I could spend $25 on books. It might even last two days if I am extra busy or something. Thanks for the great giveaway, and the opportunity to pop over here. I like what I see in your blog, and noticed that we read a lot of the same blogs. The best part of BBAW - new friends and new reads. I NEVER spend my own $ on books unless they are from the second hand store, so this would be awesome to have. Unless I have a GC, nothing gets bought. My e-mail address is dbrannon[at]gmail[dot]com. Count me in!!! You know that I will continue to stick around too!! GREAT giveaway!! 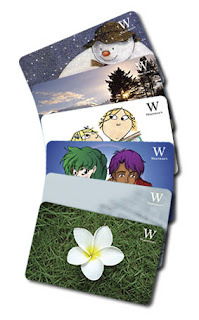 Are those Waterstones gift cards? They look like it. Waterstones is my fave book chain store, but I think it was just British. Is it in the US too? I like your banner. I have the Oz eBooks on my iTouch, waiting to be read. When I was younger, my mom had the books. Unfortunately, she has them no more. I would love to be included. And I was looking around your blog and it looks really good. Our family needs books! My daughter read and I read! My daughter came to me Friday I need another mystery book to read! Count our California family in! Loot is great! Thanks for the giveaway! I would celebrate $25 dollars. You know I would. And blogs. I celebrate those too. What a way to celebrate reading! I love it (and thanks). Oh my, thanks for this super giveaway!! That's gonna be fun!! Thanks for this give away! Awesome giveaway! Especially for my almost totally broke bank account! I could so use some nice cuddly Amazon time! Thanks for the giveaway!! Blogging can be hard, but it's all worth it in the end I think because it's exciting too!! What a lovely post. It really is amazing the work and love that goes into the whole community, isn't it? I'd love to be entered. Thank you! Thank you very much for such a kind and thoughtful giveaway. Seriously, great giveaway; I'd love to be entered. Emilysquest at gmail dot com. Oo la la, throw my name in the barrel! How cool, what a great contest! :) Could I enter please? I'd love an Amazon gift card so that I could buy Stephen King's new book, Under The Dome. Please count me in! I already have many ideas of what to buy haha! Totally awesome giveawy. So generous. I'd love to win this one as there are a few books on my wish list. Wonderful way to do a giveaway relating to books! wow, cool! contact me at everead//at//gmail//dot//com if I win! How wonderful! Please enter me for this fantastic contest. Already drawing up my wish list! This is so nice of you =) I'd so love a chance to win! I would love to win! I have so many books I would love to buy! Awesome! I'm drooling over the options of what I could get! Thanks! I'd love to win an Amazon gift card! Hi ! I would like to enter the contest ! Awesome contest! Especially since there are so many books I want. A bookstore gift card giveaway, count me in! You are going to be swamped for this one!!!! "How does $25 for new books sound?" Ummmmmmm...awesome!!! Awesome giveaway. I love giftcards. "Finding friendship and good reads online" - I echo that sentiment. Thanks, Kristen for this nice giveaway. I'd love to play please! Thanks. Wow, that's SO kind of you, who could resist a BBAW giveaway like that??? That picture has some of the cutest gift cards I've ever seen. How come borders never has cute cards when I go in? Love to win one. Thanks for the oppertunity! Please enter me! I'm happy to have discovered your blog during BBAW! please enter me in the contest! Tahnks. I would love to enter your giveaway! What a great contest! Please enter me! This is so sweet of you. The person who wins will be one lucky duck! Please enter me! This is so wonderful--thank you! What a wonderful giveaway! Please count me in! Please enter me in your awesome giveaway! Thank you! What a wonderful giveaway! Thank you! I'm at a loss to say something original at this point, but thanks for the giveaway nonetheless! What a great giveaway! Please enter me - bastet57 (at) gmail (dot) com. I love bookstores! I love giftcards! Sweet. I'd love to win. Found you thanks to BBAW. Great giveaway, please enter me as well. Fantastic Giveaway!! Please enter me. I would love a chance to win!! Thank you!! lovely! and a splendid blog as well! Nice giveaway. Count me in! Great idea! This is a wonderful giveaway for one and all! I love your closing sentiments ("came for the giveaway, consider staying for the blog") and your header filled with Oz is great. Great idea for a giveaway - thanks! Would love to whittle away at my wish list. Thanks for a great contest. This is an awesome giveaway! Thank you! I found your blog through BBAW. Thanks for having a giveaway. A GC for a bookstore is a treat for a readaholic like me! I love contests & giveaways!!! I'm addicted to them...sort of like Golom saying Precious :P Anyhoo, this is my first year trying out BBAW....so I'm super excited...I actually wasn't aware of such an event until late last night when I was just surfing randomly...it would be awesome if there was some sort of reminder sent out next year so that everyone can jump in & participate...Just a thought...Happy Reading Everyone! What a lovely giveaway! Please add my name to the virtual hat. Thanks! Ooh, giftcards are the best! Ahh, GCs (L). Count me in! I can definately find some books to buy with a GC! wow.. great contest... count me in..